How could this cute little crab with the pretty blue eyes be so mean? Meet Cymo spp. eater of Acroporas and other prized SPS corals. These crabs are about the same size as beneficial Tetralia spp. crabs and are often mistaken for “good” crabs. The differences? 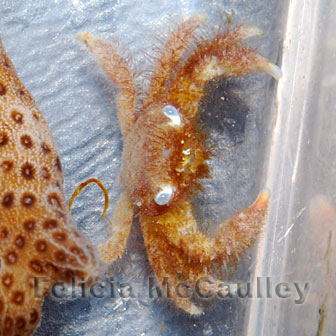 Blue Eyed crabs are hairy, not smooth like Acropora guard crabs, and as the name suggests, they often have blue eyes. The eye color can sometimes be more whitish or washed out, especially in smaller individuals. It’s not easy to see this small crab in an SPS colony, and usually the path of destruction is visible first. If you find off-white skeleton starting more at the base of your SPS colony, look for one of these bad crabs. You’ll likely find it at the edge of its methodically destroyed white patch picking coral tissue with its claws and shoving the healthy tissue into its evil little mouth. Removal is just as difficult as any other unwanted crab in a reef tank. I find a pointed metal or bamboo skewer works best. It’s easiest if you can pick up the colony and chase the little crab around, poking its underside with a thin, pointed object like the inside of a ballpoint pen until it lets go with its legs and bails out. The Cymo andreossyi from Singapore, an eater of Acropora and Pocillopora corals, is listed as Vulnerable on the IUCN, but the others are common and often come as hitchhikers on wild caught coral colonies. it’s not blue eyed because it’s gonna shed? That’s a great photo Felicia. nope, it has blue eyes. More noticeable in the larger size photo.